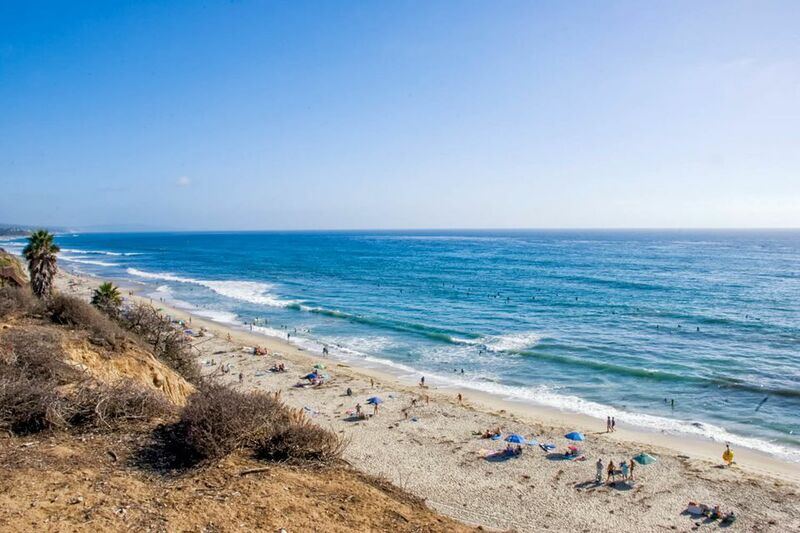 San Elijo State Beach is located in Cardiff, Calfornia just north of San Diego. All the highly rated campgrounds are situated near the ocean, but to get your toes into the sand requires traversing a stairway. A highlight of San Elijo is the town is nearby and visitors can walk across the main road to find coffee and sandwich shops with recognizable names. Those that want to camp at San Elijo but do not own an RV can contact Albert’s RV, Luv2Camp, RV Rentals San Diego, or Travel Time RV Rentals as they are the only approved vendors authorized to deliver and set up an RV at the campground. San Elijo has 157 campsites total. Among them are 130 general campsites, six handicap accessible sites, 28 RV sites, and a few tent sites. There is an eight-person maximum per site. Trailers and camper/motorhomes are back-in only and the locations can accommodate up to a 35 feet long vehicle. The campground is laid out in a series of loops, between the Coast Highway and the Pacific Ocean. The views vary with some sites that are directly ocean facing while others may have shrubs or trees in the way. Wood-burning fires are permitted, but only in an established fire ring. Propane and butane fire pits and burners are not allowed. Dogs are prohibited on the beach, must be on a leash less than 6 feet long at all times, and may not be left outside at night. The campground has restrooms and showers, a laundry, and a convenience store. They also have outdoor showers for washing the beach sand off, but those may be turned off during a drought. Swimming, snorkeling, and scuba diving are available at the nearby reef and the tidepools at the south end are fun to explore at low tide. Between mid-September and mid-October, nearby Cardiff State Beach hosts two annual surfing contests but the surf breaks are more mellow at San Elijo. Budget-conscious visitors may prefer to shop for food and supplies in town, where they're less expensive than in the campground store. Be warned that the ground squirrels are likely to try stealing food and a tip to keep ants at bay is sprinkling baking soda around RV wheels and stabilizers. For light sleepers, earplugs are recommended to block out the traffic and train noise. California State Park campgrounds including San Elijo State Beach must be reserved in advance and reservations can be made 6 months in advance. Check-in time is at 2 p.m. and the operating hours for the State Beach are from dawn to dusk. San Elijo State Beach extends along the 101 Freeway and the entrance is 3/4 miles north from the San Elijo Lagoon entrance channel. From Interstate 5 take the exit at Encinitas Blvd., and head west. Make a left turn on South Coast Highway and continue south about 2 miles.